Is the President’s Vacation in Martha’s Vineyard A Good Idea? The president is taking a much needed vacation, this time to Martha’s Vineyard. So what does the Washington Post have for a headline this morning? Martha’s Vineyard isn’t exactly in the middle of nowhere, and they do have internet connections, an airfield and a ferry service. So presumbly the President is keeping in touch with the world.So why the headline? … if President Obama has already purchased the new bus, why not use it Winnebago-style to see America with his family for a week, visiting a national park, a closed-down plant â€” or a real vineyard? Actually, I think that the President’s vacation choice is a good one. The advantage of vacationing there is that the locals are used to celebrities, and so treat these VIP’s as “just folks”, and the security is a bit easier than in a lot of places. And it is a “child friendly” area, so he can browse the shops and restaurants with his wife and kids (and half a dozen secret service folks) without teaparty types causing a scene. Martha’s Vineyard is a pretty Island, but then I knew Martha’s Vineyard when it was still full of ordinary folks and hadn’t been taken up by the posh set. (did you ever see the crowds in the movie Jaws? That will give you an idea.) The island still is a beautiful place, and despite the right wing press hinting it is a resort on the level of Palm Beach Florida or the Hamptoms that’s not true:Â even if you are pinching pennies, it still can be a place for middle class Bostonians to relax. Given the fact that Obama is carrying all the problems of the world on his back, I don’t begrudge his vacation, but as VDHanson points out on the (Right wing) Blog “The Corner”, the president already has an image problem, with the perception by some that he is out of touch with the “average” American. So spending a vacation with the press hinting he is hanging out with the posh set isn’t going to help things. So should the president pull a “Bush” and go out and cut scrub trees with a chainsaw? I don’t think so. He might accidentally cut himself. President Obama never seems to have had a “blue collar”job or even done dirty work in a fast food joint or cafeteria. And although he has spent much of his life helping people, his problem is that he is helping people, he is organizing people, but he is an outsider doing all these things for other folks, not one of the guys. He’s always been the boss in charge, not someone who worked his way from the bottom to the top like other politicians like Joe Biden or Bill Clinton, and although this elite upbringing is not unusual in American politicians, President Obama hasn’t even bothered to try to master “good old boy” touch like George Bush or John Kennedy. That “tin ear” to the culture of suburban and small town America may lead him to problems in the next election. So should the President take VDH’s advice and go help in a clean up? Well, true, Palin and family helped in the cleanup after the Alabama tornado. But one does not have to be a right wing Republican to help. 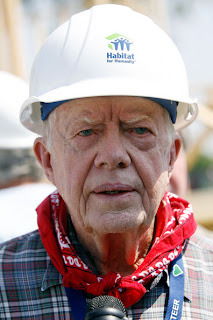 But maybe if he and his family spent their vacation doing a “Jimmy Carter” and help to build some homes in Alabama, he might get a slightly better poll ratings. President Obama ran as a miracle boy who was lauded by the elites in the media and in Europe, and the American public, tired of the constant ridicule of a less than articulate President Bush, thought he would be a change. But President Obama sees the “government helps people” as the only way to do things. There is sometimes a need for this, but lots of folks fear faceless bureaucrats and would prefer smaller less complicated ways of doing these things. (The principle of subsidarity, sending help from the nearest institution). And one wonders if the President is aware that in most of America, neighbors help each other, family helps their relatives, and spouses and children help the old folks, and church ladies make sure you have a cassarole to eat when you are sick. …the same geography that left us in the path of this destruction also created, across generations, a way of life that would not come to pieces inside that storm, nailed together from old-fashioned things like human kindness, courage, utter selflessness, and, yes, defiance, even standing inside a roofless house. President Obama’s bus tour was a waste of time, because although he was traveling in the “heartland”, he didn’t bother to listen to people and find out how they really lived or feltÂ about things. And that, not his choice of vacation spots, is the real problem the president faces next year. Nancy Reyes is a retired physician living in the rural Philippines who blogs at Finest Kind CLinic and Fishmarket. She is a Democrat. 2 users commented in " Is the President’s Vacation in Martha’s Vineyard A Good Idea? " It’s a good thing that Mr. Obama and his minions (He has minions? Yeah, what else would you call them?) buy into their OWN propaganda, otherwise we would in worse trouble. We’re in a world wide Depression (Still early in the cycle of it, and it’s going to get a lot worse, before we hit the bottom of it, never mind start to climb out of it.) and Mr. Obama and his people think they can MANAGE events SKILLFULLY. His own supporters are going to act against him in ways he has not forseen. Think about those flash mobs, I don’t think he has. Some valid points, however Pres Obama has shown absolutely no interest in anything other than having his way. As for being boss. You can’t be serious, he has never been an employer of anything. His complete disregard for contracts, and negotiation demonstrate an intractable personality, obsessed with his own image. His statements “I can trump that, I won, and I directed the operation (against OBL). Even FDR never went that far.